Mold remediation is a science in and of itself. Dangers like cross-contamination, further mold growth, and released spores all make remediation a very important step to be taken—and one that should be approached with caution and awareness. Once you've identified a mold problem, what should your next step be? The following information is excerpted from an article by leading natural physician Dr. Joseph Mercola. In this article, he refers to his interview with renowned toxicologist, the late Dr. Jack Thrasher. 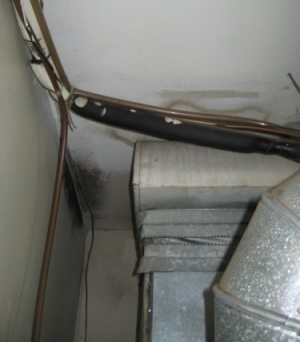 As soon as you've identified the problem, you have to stop the water intrusion and remediate the problem at its source. If you have just a small area of surface mold, you probably don't have to call in an expert. However, only attempt to clean it if it's limited to the surface of a small area. You cannot "clean" deep-rooted mold. Dr. Thrasher has one word for those of you who have bought into the home-remedy advice to "kill off mold" with ammonia or bleach: Don't.